Musical luminaries Bob Dylan, John Mellencamp, and Willie Nelson toured the United States together and played concerts at ballparks in 2009, and Pawtucket, RI’s famed McCoy Stadium, home of the Pawtucket Red Sox, had the honor of presenting the concert to adoring New England fans. To commemorate an event as exciting and singular as this, The City of Pawtucket and the Pawtucket Red Sox commissioned Ahlers Designs to create a custom designed artwork to be presented to each musician. 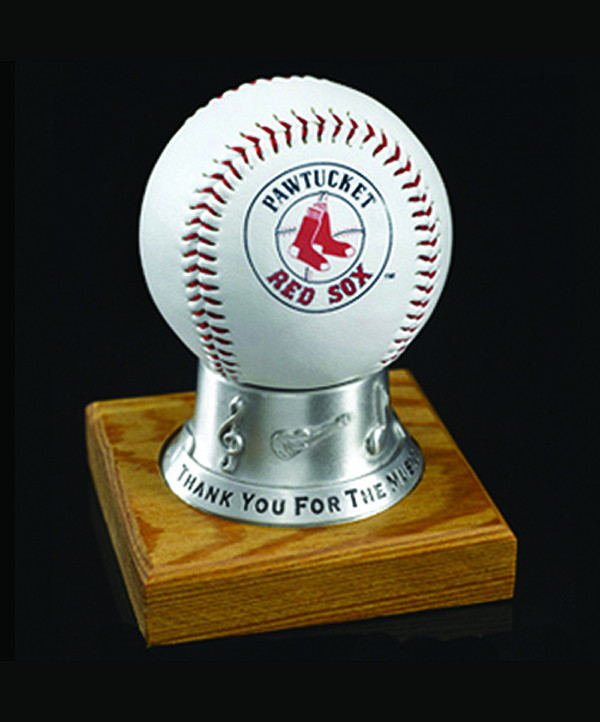 Gail Ahlers started designing the one-of-a-kind, sustainable gift by showcasing an authentic Pawtucket Red Sox baseball—signed by Pawtucket’s Mayor, James Doyle—placed atop a cast pewter magnifying disc that revealed personalized messages to each recipient. The pieces were decorated with classic musical motifs and a statement of gratitude: “Thank You For The Music.” A wood base reclaimed from a bygone Pawtucket-based candy factory supports this unforgettable American made gift. This exciting commemorative gift continues to celebrate excellence. It was once again presented by The City of Pawtucket in 2013 to The Cowsills, a famed Newport, RI, music group, while they performed at the much-loved Pawtucket Arts Festival at Slater Memorial Park.